PARIS, France – French streets are once again bustling with bicycles, particularly in the bigger cities. After many years of cars only, the French seem to have remembered the bicycle is an effective means of transportation. One example – Paris’ bike rental system Vélib has become the global benchmark for public bike share programs addressing traffic congestion in cities. However the rising popularity of cycling is not yet reflected in sales of bikes and accessories. Perhaps the French are taking their old bikes from the shed and don’t care about buying a new one… yet. In 2009 the French spent a total amount of €1.325 million on bicycles and accessories, a decrease of 4.5% compared with 2008. Last year some 3,132,300 units were sold at a value of €819 million. Consumption in terms of volume dropped by 6% while the amount of money spent by the French last year on bicycles also decreased by 4.5%. In the same period the after market sales of components and accessories declined by 6% compared with 2008, to €506 million. 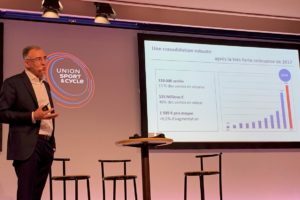 According to the French industry organization Tous a Velo – Conseil des Professions du Cycle, the cycle market is holding its place in face of the economic situation. Despite this positive perspective, the 2009 statistics clearly indicate the French are spending more money on cheap bikes and the market share of IBDs is declining. In 2009 the average value of bicycle sold by the IBDs grew by just 0.5%, while the Sport Department Stores saw a rise in their average price by 6.1% and the Supermarket increased their average price by 8.1%. As a result the market share of the IBDs in terms of value fell from 53.5% in 2008 to 48.5% last year. Apparently the French consumers are easily tempted by the low prices and keen marketing campaigns of the Sport Department Stores and Supermarkets instead of loyalty to their IBD. Many specialty retailers have noted a sharp increase in road bikes with flat handlebars at a retail price between €500 – €600, catering to people riding for fitness and health but don’t like the riding position of traditional road race bikes. Another popular segment is the hybrid bike, together with all the equipment that goes with it. After years of decline, the city bike is now rising again, although in France they only 6% of the overall market. The average price for a city bike is currently around €220. This is much lower than in the North European countries, but it is improving. The same situation is seen with e-Bikes, sold for an average price of only €950. 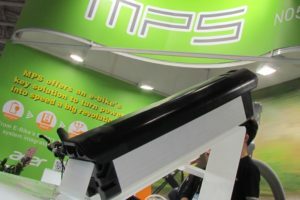 The French industry is also looking forward to the introduction of some kind of state subsidy on a national level to encourage the French to use their bike to get around on everyday trips. The structure of the French market has been moving steadily towards mobility bicycles instead of sports only. Last year, the mobility segment, which includes city bikes and e-Bikes increased from 22% in 2008, to 25% of all sales. A total of 23,700 e-Bikes were bought by consumers last year, compared to 15,300 in 2008, 9,700 in 2007, 6,000 in 2006 and 3,900 in 2005. 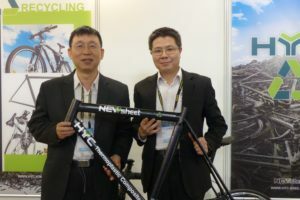 Despite the huge growth (55% ) in e-Bike sales between 2008 and 2009, the e-Bike is still a niche segment, totalling just 0.75% of the market in units. This minor market share makes France one the laggards in e-Bike sales related to other European countries such as the Netherlands (140,000 units), Germany (100,000 units) and Italy (60,000 units). The leisure bike market, which includes ATBs, hybrids and junior bikes continued to decline – from 68% in 2008, to 65% in 2009. Finally the competition range sports bike market, like road racers, ATBs and BMX bikes remained stable, with a 10% share of the total sales. With about 3.1 million bicycles sold per year, France is in the forefront in terms of per capita consumption of bicycles. 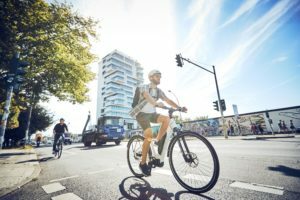 Paradoxically, each bike will travel less than 90 kilometres per year, which is just ridiculous compared to our neighbours in Northern Europe who ride more than 300 kilometres per year. The Dutch, adult or child cycle as much as 1,000 kilometres per year. So if a Frenchmen buys a bike, it is ridden only slightly. And when he chooses his bike, only one out of four is bought at the IBD. As a result the French city bike is typically a cheap, low-end bike whose life will be short. The low average price also puts pressure on retailers’ margins. Many outlets are just at the break-even point, in turn affecting the quality of the IBD. 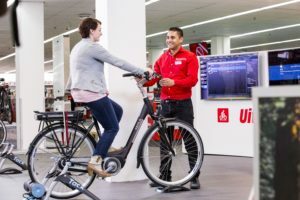 Training and recruitment of qualified staff on a variety of products such as city bikes, remains a major problem in this industry, despite efforts by professional federations. Undoubtedly the solution would be to upgrade the city bikes sold in stores. The significant increase in cycling networks initiated by the city councils and Ministry of Transport will hopefully give a push in this direction. Another initiative to support the IBD’s image is the Shimano Service Centre concept. Shimano France is giving its Service Centre (SSC) concept a new emphasis, in order to attract more IBD’s. One of the new shops with a Shimano Service Centre is the Culture Vélo outlet in the French town Hénin-Beaumont. It has all the elements of the SSC concept, which easily fits in the 500 square meter store: large format displays, narrow casting, the bike fitting system and all products distributed by Shimano France are displayed here. At the 2010 Eurobike show a more complete Peugeot range will be launched; including a series of e-Bikes. Cycleurope has not chosen for an exclusive IBD distribution but car dealers will also be able to sell the Peugeot range. The Peugeot brand bikes will be available via Cycleurope’s dealer network in Europe, South America and in Asia, particularly Japan. In France Cycleurope will distribute the Peugeot bikes mainly via the 450 Vélo & Oxygen outlets.